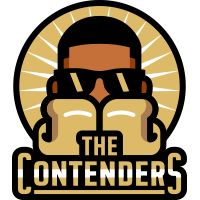 The Contenders is a recurring series of conversations with people who will be — or should be — in line for victories during this film awards season. Antoine Fuqua is used to setting up big plays. For most of his life, he’s been casing the space around him and figuring out where the sweet spots are. He did this first on the court and, now, in Hollywood. The director, most known for getting the right players in the best position — his biggest victory to date is coaching Denzel Washington to an Oscar for 2001’s Training Day. Fuqua, who went on a scholarship to play basketball at West Virginia State University (he later transferred to West Virginia University to study electrical engineering), has been a point guard his entire life. He holds court on a soundstage — or, as is the case with his new project, The Magnificent Seven — under the blazing sun in Louisiana and New Mexico. And he’s ready for his next big play. The director of 1998’s The Replacement Killers, 2000’s Bait and 2015’s surprising Southpaw, Fuqua is a longtime fan of Western films, and dared with his newest project to remake a beloved 1960 classic — with a colorful twist. Reviews have been mixed coming out of the Toronto Film Festival, but don’t get it twisted. The film known in the tweets as #Mag7 is headed for a big opening weekend — and is a directorial triumph with timely underpinnings and allusions. Oh, and the ending? Even if you’ve seen the 1960’s John Sturges-directed version — wait for it. What made you want to make this film — and a Western at that? The story. I always loved the story, and I love the idea of self-sacrifice for others. But also, what really got me excited was when I got my casting. You know … Denzel and Byung-hun Lee, that got me even more excited about wanting to make the film because then it became something of my own, something different, you know. So that’s when I got really excited about it. And then, by that point, you know, putting the rest of the diverse cast together, I got more excited about it. What did you say that made Denzel Washington say yes? I know you had to put in work. I don’t think it was one thing. I just showed my passion for it, and I played some music for him at the table in this restaurant, and I was describing to him how I saw him dressed in black and all that. He started smiling, and I was like, ‘You love it, don’t ya?’ I had a vision … and as soon as we started talking about it, he signed on because of my passion for it. You’ve told me before that playing basketball changed your life. How does that play a role in who you are in Hollywood? Magnificent Seven is a great example of it because it was a hard shoot. It was hot, right? Blinding. If you’re the point guard, you got to run that floor. And if you’re the coach, you have to make these athletes move the way you need them to move and you need them to be disciplined because of the plays. For me, I’ve been playing sports since I was 6 years old. It was basketball and football. I had to walk from home in Pittsburgh, Pennsylvania up to the football field, which was a long ways away with all that equipment. I was so skinny I could barely carry all that equipment. But if you wanted to play, you had to walk yourself to the field and play, and then walk home after practice, and sometimes two-a-day. That discipline helped me with filmmaking decisions … Convey your vision … how you want to run the play … And you got your star players … your Denzel Washingtons … you got to know how to move them, as well. 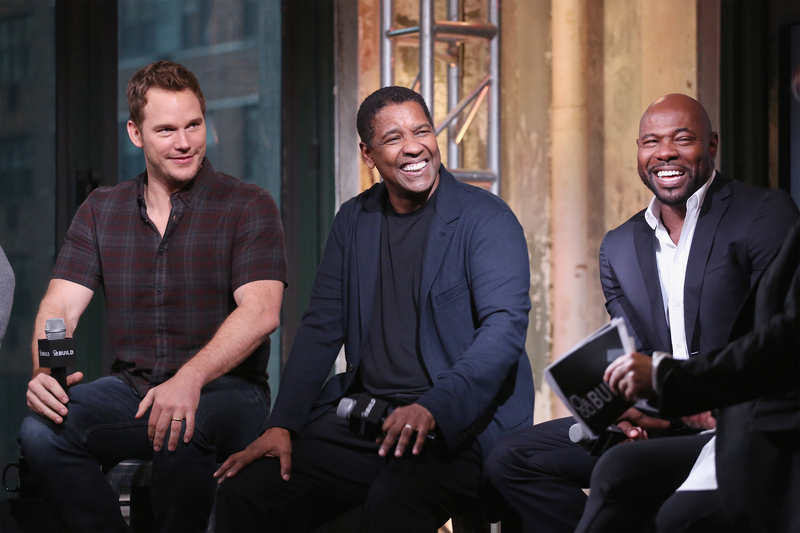 The BUILD Series presents actors Chris Pratt (left), Denzel Washington (center) and director Antoine Fuqua (right) to discuss The Magnificent Seven at AOL HQ on Sept. 19, in New York City. What’s more challenging: playing college basketball or coaching an actor like Denzel Washington? Coaching. Basketball was easier because I was on the floor. Whatever God-given talent I had, I was having fun, always. But when you’re the coach, you’re not on the floor — I mean, you are, but you’re not, right? You’re trying to get everything to click the right way. On some days it might not be clicking and you gotta deal with the personalities of many different people. Not just your stars, but the whole crew … It’s challenging. I learned a lot from Denzel. Denzel is an amazing teacher for me about life. We talk about the Bible, we talk about a lot of things. I still box every day. And Denzel, he basically has a gym, a boxing ring. You guys boxed on set? No, it’s in our production house. We have a big warehouse and we put a big ring up, and we have a trainer to come in there. We go in there and get down. In the morning, we talk in the ring. That same energy. Denzel will get in the ring, too? Yeah! He’s a better boxer than me! I’ve been boxing 20 years, 21 years. He’s in there every day. Your Magnificent Seven isn’t a note-for-note remake of John Sturges’ 1960 Magnificent Seven. It’s inspired by that and Akira Kurosawa’s original 1954 Seven Samurai. The diversity is amazing in your film, and it’s actually authentic to the West. That’s right! We read a lot of books about different characters. We read about tough women. There’s one woman named Black Mary because she used to knock men out. Pick them up at bars, and knock them out. The Asian community, obviously the black community was there — we were all there. It was the frontier. Hollywood — back in the day — was having issues with race. Refused to represent it the way that it needed to be, and the way it was. Instead of talking about [that], I just wanted to do it. With very few exceptions, race almost isn’t addressed in your new film. And that felt purposeful. Was it? It was … MGM and Sony backed it up 100 percent. We took all that out because people go the movies with their own prejudice, their own baggage. When Denzel Washington walks into a bar, and there’s a bunch of white people there, why does the bar stop? At the same time, have Clint Eastwood walk into a bar, and the bar stops. Why does the bar stop? Is it because of the way he wears his gun, that he’s a gunslinger? Or is it because of his skin? I decided that the audience should decide. So, I did that all the way across the board … they’re all, to me, a bunch of rough, tough guys. All of them living on the edge … all a little broken — let the audience fill in the blanks. That’s the beauty of motion pictures. That’s the beauty of cinema. It used to be we didn’t have dialogue. They were silent pictures, so everything had to be done based on what you saw. If you saw a black man walk in the bar and bar stop, what does your own prejudice say? Our expectations of seeing period pieces in film are that you hold your breath waiting for the hurl of N-words at the direction of a character like Washington’s. We know what all that is, and I don’t need to make a trip over there to what was happening back then. What’s the point of that really? What would it achieve? That said, you threw me for a loop the last 10 minutes — we won’t spoil it here, but can you talk a little bit about the hidden message in the movie? Yeah, it’s a visual medium. That’s the whole power of cinema, that you can say something without saying it. And when you do something like that, it’s not faking anything. You get it! The message is … basically, apologize. As we’re entering the end of 2016, we’re seeing a number of films with African-American creators behind the camera, and then you have people like Washington who are in front of the camera, making the case for colorblind casting, diversity in films … Do you think about awards and being nominated? It’s different for me, really, because here’s the thing: As a director, it’s harder because some of the great filmmakers that I admire, that are my mentors, some of them, didn’t get Academy Awards until they were older … Some of them didn’t get an [Oscar] until they were like in their 60s or 70s. Martin Scorsese won his first as best director for [2006’s] The Departed. That was Martin Scorsese, you know? So I mean, I’m going to keep on ballin’. I ain’t going to stop until God stops me. He put me in the game, and I’m going to keep going. So, if I get the trophy, cool. If I get nominated, cool. If I don’t, that’s OK. I’ve already gone way beyond whatever I imagined. I want young men and women of color … to realize … don’t let that define you. And it doesn’t make you ‘less than’ if you don’t get the trophy, you know? Because the truth is, after that night’s over, most people forget who got the trophy. I know a few of them that got trophies that can’t get jobs right now. So you got the trophy, and everybody had a great time that night, but back to business. This is business. This is show business. I think of you as a film guy, but you’re dipping your toe in the digital TV space with Ice for AT&T Audience Network and producing a Training Day series for CBS. It’s another creative medium. I don’t limit my mediums. I want to do a play or Broadway. Sidney Poitier told me once, ‘You have to feed your artist.’ Feed your artist. If you have a passion to do something else, then do it. There’s no box. Keep your skills sharp. Kind of like hitting those layups in practice. That’s it! Sometimes you got to go left-handed. You got to go weird sometimes — switch up on it with that crossover.